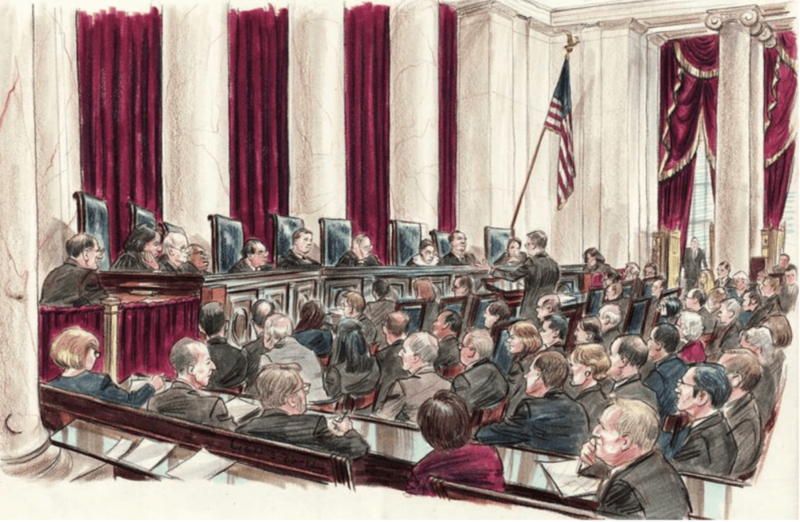 DNY – I imagine you develop feelings for the different SCOTUS justices after drawing them for so many years. How are you feeling about the change in the makeup of the court to come? Art Lien: When a new justice comes on the bench obviously it changes the dynamics of the arguments, especially when the departing justice is also the most senior. The justices sit in order of seniority, with the most senior seated to the chief’s right. When that senior seat is vacated all the justices move up a seat. The change in seating has pluses and minuses for the sketch artist. It means Kagan will now be on the far end of the bench where once again I will struggle to capture her (she was easier in profile). On the other hand, I’ll get a better look at Gorsuch when he moves to the end of the bench closer to where the press sits. With Justices Sotomayor and Breyer, both active and lengthy questioners, moving to the near side I should have more opportunities to see the lawyers. 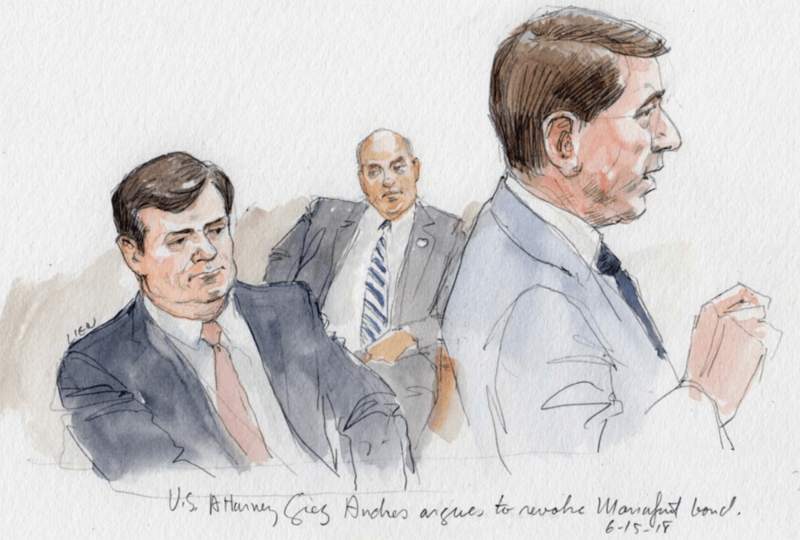 DNY: You are often a witness to arguments that will have a wide-ranging consequence for our country – do you ever find it difficult to listen and draw at the same time? Some artists are really good at following what is being said in the courtroom, unfortunately, I’m not one of them. I’ve always tended to zone out when drawing – a right side / left side brain thing? Nevertheless, I do prepare before most arguments so that I am a little bit familiar with the cases and so will have a sense of how the argument is going. I usually snap out of my drawing zone when something remarkable happens, but not always. DNY: Are there any [arguments or proceedings] that stand out for you in particular? The one that stands out the most for me was the first day of the three-day ACA arguments. Solicitor General Verrilli was beginning his argument and choked. He had taken a sip of water and then hesitated and it did not go well, he was thrown off his argument and never quite recovered. The next day he did much better. 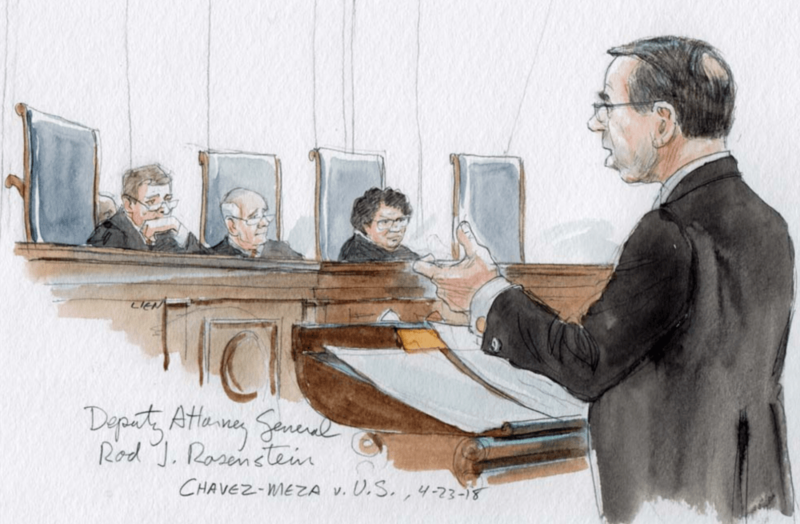 I don’t know how significant it is but I noticed that on the first day he had no papers on the lectern – a few of the elite SCOTUS lawyers like Paul Clement or Michael Dreeben argue without notes – but on the second day he did. DNY: What kind of training if any did you have for your current position? I went to art school – MICA – but the real training was on the job. I really just fell into it when a local TV station was looking for an artist to sketch the upcoming corruption trial of our Maryland governor. I went into the newsroom and did a few sketches of people working at their desks and got the job. 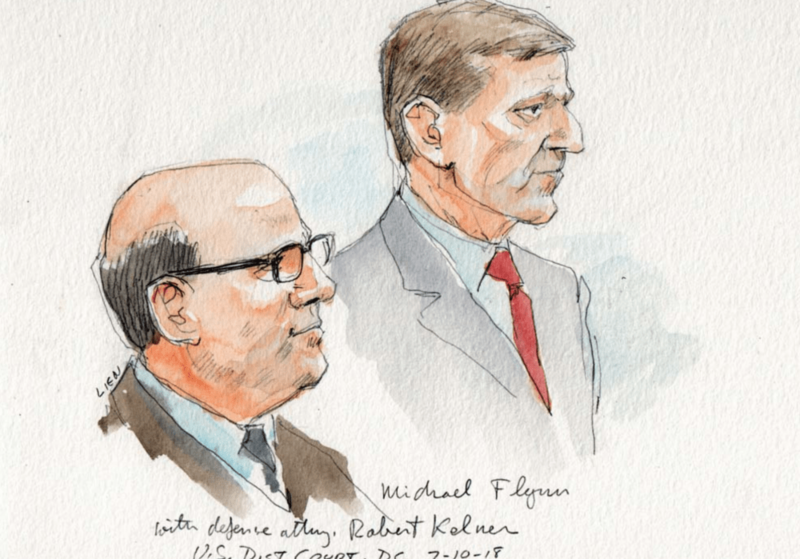 But on the first day in an actual courtroom everyone was so far away and my media, gouache on Color-aid paper, was so unmanageable that I did a terrible job and they fired me. Fortunately, I didn’t give up, and, after changing from Color-aid paper to chipboard, which soaked up the gouache instead of it pooling and running, I went back to the courtroom, sent in my work even though they weren’t paying for it, and they hired me back. Over the years I’ve continued to experiment with different media. I love watercolor because there are so many ways to approach it. Lately, I’ve been inspired by Mark Taro Holmes’ “The Urban Sketcher”. DNY: What are your go-to drawing materials? How did you arrive at those choices? Right now I use a mechanical pencil (no need for a sharpener!) and watercolors that I apply with a waterbrush. The waterbrush is a nifty new tool that has water in the handle. It’s soft plastic so you can squeeze water through the brush thereby cleaning it at the same time. Over the years I’ve used many different media, and some haven’t worked well at all. When I was first hired I decided to use gouache on Color-aid paper. I was getting nice effects in the studio but in the courtroom the non-absorbent Color-aid paper caused my colors to run all over. Next, I used gouache on cardboard, regular grey chipboard, and that worked fine, but it was a hassle carrying around all that cardboard. Also, that was before waterbrushes, so I had to bring a jar of water to the courtroom. When I started working in DC for the networks I came under the influence of Howard Brodie, one of the greats, and adopted his materials which were Prismacolor pencils on Strathmore paper. That worked well, but my drawings started to look too much like Howard’s. I’ve also worked in pen and ink with watercolor, and for awhile I used pastels which I hated. Before my current pencil and watercolor, I was using Prismacolor and watercolor markers for about ten years. DNY: How much time do you generally have to complete a drawing? At the Supreme Court, I know exactly how much time I have. Lawyers are given 30, or 15, or 10 minutes at the lectern so it’s pretty easy to plan. In other courtrooms, it’s very different. Sometimes, an initial appearance, a defendant may be in and out in as little as 3 minutes, in which case I’m drawing from memory. It’s often hard to know how long a witness may be on the stand, or when something dramatic will happen in the courtroom. Again, it’s often drawing from memory. As for time, with today’s deadlines, there isn’t much. It’s best when the court proceeding drags on and I can actually finish sketches (and finish has a relative meaning here). DNY: Are you able to do any preliminary drawing of the room or furnishings to speed your completion? Yes, If I have the opportunity I will get a head start on the “wide-shot”, the scene setter that can be very time-consuming. In the Supreme Court I’ll use any extra time I have working up some backgrounds, usually just architecture but with pencil, I have the luxury of erasing, so I may pencil in some figures ahead of time. I’ve found that it’s often a mistake to go too far with the background, especially when the focus is on the figure and the action. Much easier to add in background afterward. DNY: Do you find a tension between creating a good likeness and conveying strong emotional content? Is there a tension between accurate representation against aesthetic concerns in your work? When I first started out, sketching the US Senate at the time, my reporter told me that the key was getting a good likeness. I don’t think that’s right. The longer I’ve been doing this the more important body language and action have become. I do try to be objective but I’m also telling a story, so I will move things around to create a composition. Working in the courtroom is always a struggle, I’m just trying as best I can to report what I see, and get it done quickly. Over the years I’ve learned that at dramatic moments, as when a verdict is announced, it’s important to stop drawing and take the time to observe, not an easy thing to do when you’re on deadline. DNY: Who are some artists, in or out of the courtroom, who have been an influence on you? My earliest influence, and mentor who took me to my first day sketching the Supreme Court and Senate and got me my first network job at CBS was Howard Brodie. 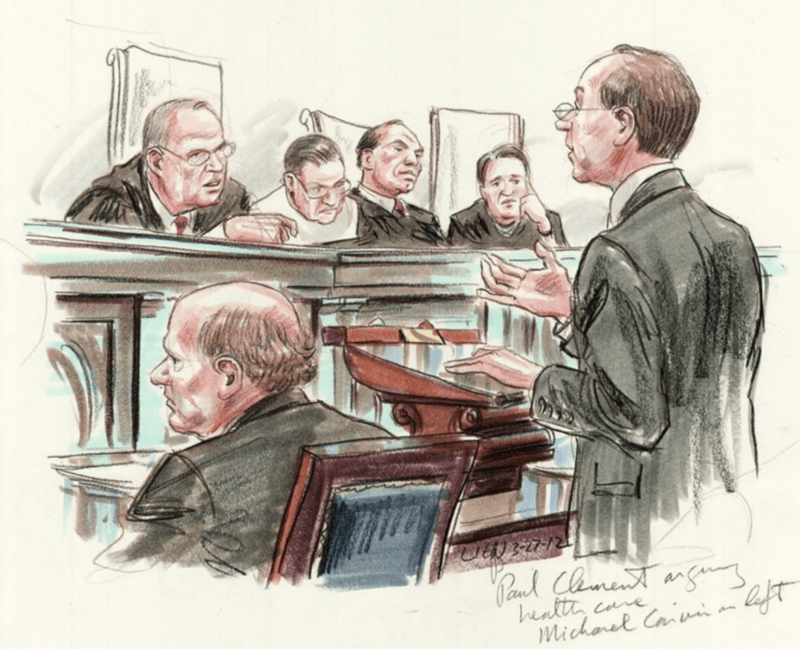 I still can’t get over how great his work is and sometimes I’ll go over to the Library of Congress – it’s across the street from the Supreme Court – and have a look at some of Howard’s original drawings. 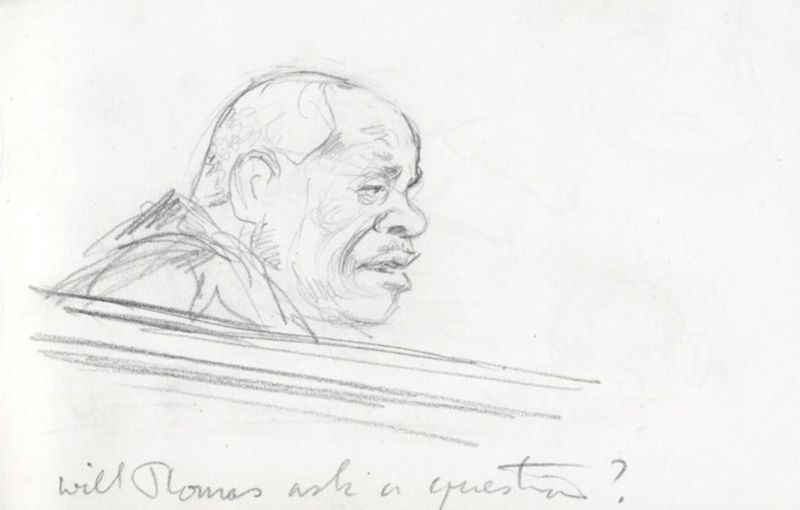 I also love the sketches of Felix Topolski. Lately, I’ve been inspired by British landscape watercolorists like Edward Seago and Edward Wesson. DNY: Do you do anything outside of work to hone your craft? Is there any research or practice that you’ve found helpful? I’m not as passionate about drawing and painting as maybe I should be. Every now and then the sketching bug bites me and I’ll take out my pencils and brushes. But really, I work so much that when I’m away from the courtroom I like to pursue other interests. Lately, I’ve been taking welding classes, I played in a mandolin orchestra for a few years, but every now and then, usually when I feel a need to change my sketching media, I’ll embark on an intensive effort for a few months and try new things and approaches to my artwork. Interesting interview. Great questions elicit really good responses! Thank you for this! Amazing work over a life time. I wish I live in a time where I was allowed to learn on the job. So interesting, and so impressive! Working fast and committing visual information to memory – critical, and my greatest challenges.